3 Types of Growth Plans For Your Creative Business – which one do you need? Not every creative enterprise is wired for growth, but they can be. According to author Les McKeown, there are 7 stages in the business lifecycle that every business goes through. Three of those are stages of decline, and that’s not what we’re concerned with here. 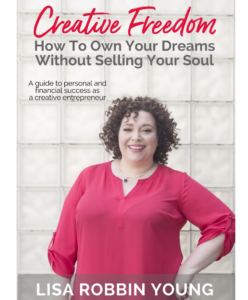 Creative Freedom focuses on the growth side of the business development process, and specifically the three types of growth plans you’ll need to navigate growing your business. This stage, according to Les, is a race against the clock to find a profitable, sustainable market for your offering. You need to match your offer to a audience big enough to keep the business afloat. Until you do, it’s a continual struggle. “Big enough” is a relative term, but the idea here is that your Great Work has an audience, and you just need to find one that’s the right size to keep your bills paid, with a comfortable margin. A fine artist creating one of a kind paintings who can live comfortably on $50,000 per year won’t need as large of an audience (or prices as high) as someone who has to make six figures just to pay the rent (the Six-Figure Distinction). A large candle making company needs millions of units in sales to make a product viable, but a smaller company might do exceedingly well on just a fraction of those sales. That’s exactly what happened in 2005 when one of the industry leading candle companies stopped making transparent candles. A company I owned at the time swooped in and filled the hole the industry giant left behind. Because we were a tiny operation, we only needed a few dozen sales each month to have a profitable product line. Very often, in this early stage, your business is either limping along as a “side hustle” or a jobby. Either way, it’s not likely to sustain you without bringing in some kind of revenue from somewhere else. Otherwise, you’d be out of Early Struggle and headed to Fun (we’ll get there in a minute). According to Les, 80% of businesses don’t make it out of Early Struggle. So you’re going to need a Transition plan that helps you ramp up from zero to profitable, sustainable enterprise, while ramping down your other income source. That could be your day job, your savings account, or even a credit card you’re maxing out every month. Transition plans are a type of temporary Growth Plan designed to get you out of one thing and into another. Because our overhead was low, we were more agile and able to experiment in the market in ways the industry giant couldn’t. We were so successful that we branched out into other sizes, fragrances, and shapes, where the industry giant had only 2 shapes available for sale in a single size. That’s something we couldn’t have done if we’d had the overhead of a large manufacturing facility and staff to support. It was just me (and my husband at the time), making and selling candles on eBay. Because we were able to tap a market already interested in the product, we saw profit quickly, but it wasn’t sustainable. With a new baby, I wasn’t able to put in enough hours myself to keep things going. I had built myself a jobby, and didn’t have a transition plan in place to phase me out and bring someone else in to continue making candles while I was taking care of my newborn. Like the industry giant, we ended up shutting down the product line and going in a different direction. I needed to build a transition plan to take me out of candle making so that I wasn’t working so much and making so little. That’s how I ended up working with direct sellers. It took a couple of years to make the pivot, but when I did, I was able to transition out of the candle company and into more ease in my life, income, and work. That’s when things got Fun. As the name suggests, this is probably the most fun time in your business. Cash is flowing freely, business is coming in like gangbusters, and you could pretty much name your price and get it. This is the time of double or even triple-digit growth, according to Les, and that’s exactly what happened when I started working with direct sellers. Within a few months of launching my book, Home Party Solution, my mailing list started growing quickly, and I had my first five figure month. That’s five figures in profits, mind you. I felt like I hit the lottery and could do no wrong. I had people begging me to work with them, my calendar was full, and I felt pretty good about myself. It’s also easy to talk about yourself at this point because you feel successful and can point to all the sales you’re making as social proof of your awesomeness. Think of it like a rocket ship. You’ve launched and gotten off the ground, but you’re still trying to break free from the resistance of gravity, and you’ll burn through a lot of your fuel to get into space. As a business, you’re still trying to move in an upward direction, so there’s a lot of work to be done in this period. You may have found a profitable, sustainable market, but you still have to do the work of selling to them on a consistent basis. Your team may grow, and along with it your spending. Upgrade the website? Sure. Invest in some new infrastructure? Why not? Hire that Director of Marketing? Sounds good to me. This is the time when everyone’s pitching in to keep all the plates spinning. You’re small and agile enough that process documents and org charts are laughable ideas. Yet this is the very time you need to be thinking about them. Getting these kinds of repeatable tasks documents is the fastest way to speed through the next (and bumpy) phase, Whitewater. This is where Fun starts to fall apart. You’ve been seeing some financial success, but now you’re dropping balls. Calls don’t get returned and deadlines get missed. At first, it’s a rare occurrence, but then the frequency picks up. The business has gotten more complex, either through more staff, more product offerings (and client demands), or both. According to Les, this is the time when you “can no longer improvise your way to success every day.” And you can’t just sell your way out of it. You’ve got operational problems that are hamstringing the company: there’s no set way of doing things, or if there is, it’s still in your head and not documented anywhere, for example. At this point, you’ve got a choice: go back to Fun, or press on to Predictable Success. Either way, once you’ve broken into Whitewater, you need to course correct, and that’s when it’s time to look at the final Growth Plan. It’s easy to dismiss Maintenance, but I assure you, this is a bona fide Growth Plan. An author friend once told me that there are no lateral moves, because if you stand still and stay at the same level, everyone else is moving forward, which means you’re falling behind. Maintenance, then is about making sure there’s enough income coming in to sustain the current level of the business without losing ground. That’s why, whether you choose Fun or Predictable Success, you’ll need to shift into Maintenance mode at some point. Sure, you might continue with a Momentum Plan to increase the scale and scope of your business once you hit Predictable Success, but eventually, you’ve got to come back to a Maintenance Plan or you’ll fall into the decline side of the business lifecycle. Maintenance is where small tweaks make big changes. Setting up a simple system that makes it easy for you to let go of a task and delegate to another team member may take a little bit of time on the front end, but it frees you up to do the tasks that only you can do (your zone of genius). In fact, systems and processes, combined with the right amount of agility and responsiveness, are the key elements that keep a business out of decline and on the growth track. Why would a business choose to go back to Fun instead of moving to Predictable Success? Actually, most creatives I’ve met who are looking to be a “lifestyle entrepreneur” wouldn’t move into Predictable Success. They’d stay in Fun, because there’s no need to scale. You don’t want to scale up. You want to keep things personal and intimate, or you’re the sole creator and you have no desire to license your work. You want to keep control of everything and have final approval. In essence, you enjoy being the bottle neck to some degree and don’t want the hassle of systems, processes, and organizational structures. Keep it simple, and you’ll gladly settle for less growth over time. You’ve found your Enoughness Number and you’re happy to stay there. But if you’ve got a vision for a global enterprise (or even a national one), chances are good, you’ll want to move into Predictable Success. When you have a profitable, sustainable business that has scaled beyond Fun, through Whitewater, you’ve achieved Predictable Success. The only reason to grow to this point, according to Les, is because you want to scale up your business and become an industry leader. 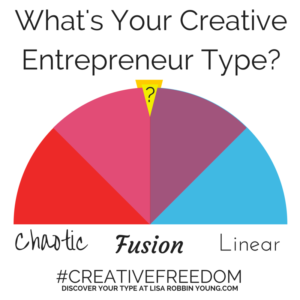 Many creative entrepreneurs never need to go this far, but some (like Oprah, Apple, or Michael Graves) do. What happens next? Theoretically, a company could stay in Predictable Success indefinitely, but more often, a company begins to rely too heavily on processes, policies, and systems, forsaking agility, responsiveness and innovation, and fall into decline. The interesting thing is that you can reverse-engineer these Growth Plans to turn these declining businesses around, but very often, they’re too stubborn to listen. Yeah, I’d say you’re still working out your transition plan and looking for that profitable, sustainable audience. A thought came to me today for you – have you reached out to any of the nature societies? I’m thinking like your country’s equivalent to the Audubon Society? That’s a non-profit group here in the US for bird lovers – heck, maybe even try reaching out to them. They do campaigns on the regular and the thought I had was to make a bird calendar – 12 months of bird images for bird lovers. Or even greeting cards or something.